For the first of what I hope will be many Cookbook Critiques on this website, I enlisted the help of my fellow foodies of our SASSY Supper Club to try out a range of recipes from Pat Crocker's "150 Best Tagine Recipes." Since I had already preempted the lamb category, four other SASSY members each chose a recipe from the poultry, beef, fish or vegetable categories. 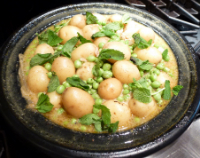 My own efforts in cooking two lamb Tagine dishes - and there is a tale around that - are described in Gillian Tries out her Tagine. As we had all cooked our dishes in our own kitchens we had to carry them over to the party location. We gathered together around 6:45 in our hostess's apartment, opened a couple of bottles of wine and tried two of the starter courses from the Tagine book. 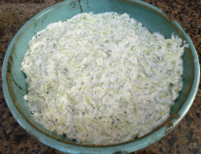 The first was the tsatziki recipe made with yogurt cheese, garlic, mint and cucumber. We served it with toasted pita bread and it was refreshing and delicious. The Hot and Spicy Chickpeas and Almonds was judged less successful. The contrast between the soft soggy texture of the chickpeas and the crunchy almonds was generally not flavoured though the spicyness of the dish went down well. We laid the Tagine entrees out on the serving ledge together with the Moroccan Orange and Pomegranate Salad, and asked each cook for a quick comment on her dish. Most found the recipes easy to follow. Only two actually used a Tagine, The others used their regular casserole cookware. Just to clarify, the term Tagine refers both to a typical Moroccan style cooking pot with a conical -shaped lid, and to the dishes made in these pots. While the general consensus was that the mix of flavours and textures was terrific, certain dishes scored higher with the group. The Citrus Chicken Tagine was one of the favorites. The recipe did not specify so our cook used chicken thighs which are usually more moist and flavourful. The dish looked appealing and tasted great. 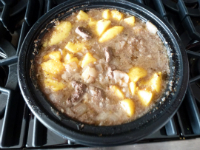 The beef recipe selected was the Ground Beef and Root Vegetable Tagine. 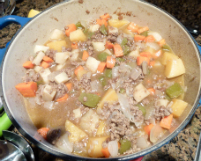 The recipe calls for rutabaga, carrots and parsnips but you can substitute other vegetables. Our cook's concern was that the turnip that she used was very firm and that it did not soften within the cooking time specified. For the fish and seafood choice, our hostess picked the Minted Lemon Whitefish. The dish looks very attractive and tasted lovely. The difficulty lay in timing as it would have been very easy to over cook the fish. But it turned out just fine. Our SASSY who had cooked a lamb casserole for our previous Moroccan dinner chose to do a vegetarian Tagine this time and made the Algerian Chickpea and Cauliflower Tagine. Red peppers, tomatoes and capers added colour making this also a very attractive looking dish. As the instigator of this recipe evaluation evening, I had picked lamb as my Tagine category. 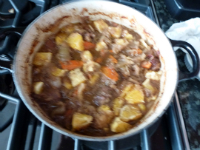 The two recipes I picked were the Fruited Lamb Tagine and the Lamb Tagine with orange and Dates. The reason that I ended up with two Tagine dishes is explained , among other things, in my story on Gillian Tries out her Tagine. 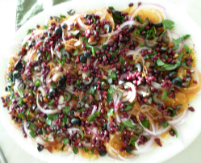 The surprise hit of the evening however turned out to be the Moroccan Orange and Pomegranate Salad which almost everyone said was their favorite dish. There were several pungent spices and flavours- the Ras el Hanout, mint, lemon-ginger and onion. I found the mix of very strong flavours a bit too overpowering for my palate but I liked the orange slices and the pomegranate. Our salad maker said she spent a lot of time searching for the ingredients . She never did find blood oranges and substituted navels. She was also unable to find Ras el Hanout so bought the individual spices and made the recipe from the book. It was obviously worth the effort because the dish was almost universally approved of. Overall most people really liked the spices and flavorings in these dishes and several were interested in acquiring the book to try more of these North African recipes. Several women already had a couple of books on Moroccan cooking and felt another was not needed in their collection. But as one of the other guests pointed out, the paperback format and reasonable price makes this book a practical asset to a cookbook library. I certainly am looking forward to trying more of the recipes - now that I own many of the spices - and of course, a Tagine!